Get to know sharks in a new interactive, informative live touch tank experience. See what it’s like to get up close and personal with sharks at the live shark touch tank, track great white sharks swimming in the Gulf of Mexico in real time, and see what’s happening with sharks all over the world through amazing conservation efforts led by top marine biologists. Sharks are not always given the credit they deserve, but that will all change when you experience Shark!, on exhibit from Aug. 29, 2014 through Sept. 7, 2015. Sharks are in a state of crisis all over the world as a result of man’s activities. The over-exploitation of shark resources, along with human-induced damage to the marine ecosystem globally, has grave implications for shark populations everywhere. Shark!, a special exhibition, educates visitors about the important role of sharks in the world’s oceans, with special reference to sharks in the Gulf of Mexico. Shark Cage with Three-sided Video Wall At the beginning of the exhibition, visitors feel as if they are in a shark cage that is in the ocean. Shark cages have evolved from being equipment originally built many years ago to protect divers while working in “shark infested” waters, to protective cages for movie and documentary filming, as well as research, and most recently, in ecotourism diving to see sharks in their natural environment. There is some controversy about their use today, since guides within the ecotourism industry usually “chum” the waters around their boats and shark cages to attract sharks. Chumming is the practice of throwing shark food, usually fish or fish parts, in the water to bait or attract sharks. Learn more about this practice and experience a great photo-opportunity that most people will never have in nature. • Whitespotted Bamboo Shark: Small shark with dark body, covered with numerous light and dark spots, dark bands, and saddles; live inshore on seafloor bottom and on reefs in tropics like the Indo-west Pacific around India, Indonesia, Malaysia, Singapore, Vietnam, Philippines, Taiwan, and Japan. • Epaulette Carpet Shark: Small shark with dark spots on body and large black epaulette spot behind gills; live on coral reefs in shallow water and tide pools in southwest Pacific, especially around New Guinea and northern Australia. Learn about OCEARCH, a non-profit organization with a global reach for unprecedented research on great white sharks and other large apex predators. In a collaborative environment established by Founding Chairman and Expedition Leader Chris Fischer, OCEARCH enables leading researchers and institutions to generate previously unattainable data on the movement, biology, and health of sharks to protect their future while enhancing public safety and education. In Texas, OCEARCH is working with Dr. Greg Stunz, Endowed Chair of Fisheries and Ocean Health at the Harte Research Institute for Gulf of Mexico Studies at Texas A&M University-Corpus Christi to tag and track sharks in the Gulf. Megalodon (meaning “big tooth”) is an extinct species of shark that lived approximately 28 to 1.5 million years ago. It is regarded as one of the largest and most powerful predators in vertebrate ocean history. The white shark, or sometimes called the great white shark, is a heavy shark with a long snout and spindle shaped body. It is very wide-ranging through most oceans of the world, which is among the widest of any fish. Today they are rare and vulnerable as a species and are listed as endangered by many countries. This lab bench area exhibits shark skin, scales, and teeth. Learn the answer to the question, “What is a Shark?,” and see images aimed to educate visitors about sharks from the new book, Sharks of the World – A Fully Illustrated Guide. In this section, discover 74 species in the Gulf of Mexico. They range from the coastal shallows to the deepest parts of the Gulf, but most are found on the continental shelves and slopes. The smallest shark in the Gulf is the marbled catshark at less than 1 foot long and the largest is the whale shark, measuring about 65 feet long. Coastal sharks are mostly small in size, ranging up to about 3 feet, and the species vary depending upon where you are in the Gulf. This component of the exhibition shows clips of the now iconic movie Jaws and the new movie Sharknado. It includes information about shark fisheries, both commercial and recreational, as well as issues with overfishing and “finning,” a process which involves the removal of the shark’s fins only, without regard to the rest of the fish, which is dumped overboard, often still alive. This is one of the prime reasons for the decline in shark populations worldwide. Today, the case for shark conservation is more important than ever before. At the end of the exhibition, learn what you can do to help the current plight of sharks around the world and how to support shark research and conservation. Reductions in shark populations in some areas by 70-90% have been reported in recent years, so there is an urgency to implement effective shark conservation and management programs. 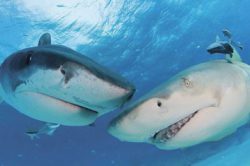 Researchers now know and understand the importance of ensuring sustainable shark populations, whether it is for commercial or recreational fishing, or for ecotourism. Sharks play a vital role in the ecosystem by maintaining biodiversity, structure, and stability. Shark! was organized by the Houston Museum of Natural Science with the Texas State Aquarium and assistance from OCEARCH and the Harte Research Institute for Gulf of Mexico Studies at Texas A&M University-Corpus Christi.